Some drivers are looking for something a little bit different; a vehicle that is unique or even iconic. The sleek modern vehicles can quickly become boring, but a few select used vehicles can help drivers stand out in the crowd. One of these vehicles is the Volkswagen Beetle, or as some may know it the Volkswagen New Beetle, which was offered from 1997-2010. From the moment this vehicle hit the market it shocked drivers with its retro styling and quickly gained a following. But, what features can drivers experience when purchasing this used Volkswagen Beetle across its many model years? In its earlier model years, 1998-2006, the Volkswagen New Beetle was known for the efficiency of its diesel engine. This engine earned a combined fuel economy rating of 44-45 mpg and helped the New Beetle become even more popular. Today, drivers searching for a used Volkswagen Beetle can enjoy this high level of efficiency which competes with only the most efficient vehicles on the market. From 2007-2010, the Volkswagen Beetle no longer offered its diesel engine but it did come standard with its more powerful 2.5L 4-cylinder engine. At this time, the New Beetle was also available in a 5-speed manual transmission or a 6-speed automatic transmission. Drivers looking for a used Volkswagen Beetle between these model years will find that the vehicle maintains its retro styling but also incorporates some advanced technology like entertainment, safety, and convenience features. The Beetle can also be found in a variety of luxury features like leather seating and heated front-seats. 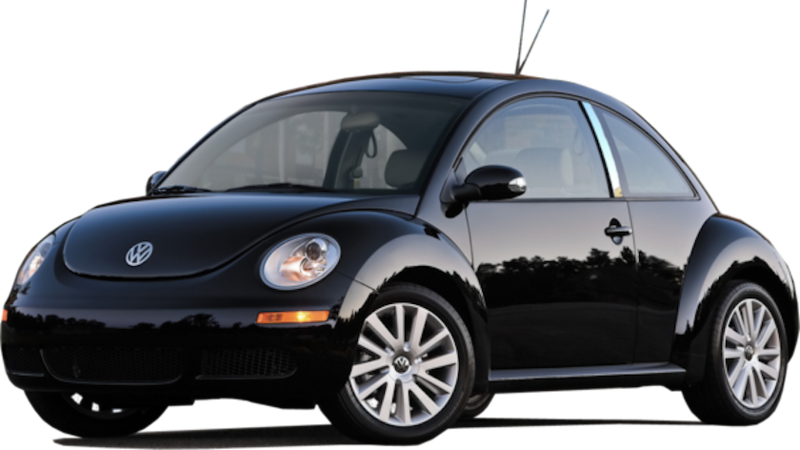 Eventually, the Volkswagen New Beetle would be replaced by the Beetle (A5). However, the New Beetle would become one of the vehicle’s most popular and iconic models. Today, drivers can find a used Volkswagen Beetle for sale at the local used car dealership in a variety of colors, configurations, trim levels, body styles, and features. But, which model year is right for you? In order to help you determine which used Volkswagen Beetle will best suit your needs, lifestyle, and budget, we’ll take a look at what each model year of the New Beetle has to offer. So, let’s get started! In 1997, Volkswagen introduced the Volkswagen New Beetle as a 1998 model. This was not designed to replace the original Beetle, as that model would remain in production until 2003. However, it featured several enhanced and updated features including front-wheel drive and the placement of its engine in the front, which also added rear storage. The New Beetle would become an incredibly popular vehicle among Volkswagen enthusiasts and would remain in production until the release of the Beetle (A5) in 2011. Today, drivers can find a used Volkswagen Beetle for sale equipped with some of the latest technology and slightly modernized styling. However, its earlier model years were known more for their retro styling and flare. For the 1998 model year, the Volkswagen Beetle hit the market as a fuel efficient, retro, 4-seater hatchback. With its new engine placement and front-wheel drive options, the new model became extremely popular and would become an iconic vehicle in the years to come. When equipped with its available diesel engine, the 1998 Volkswagen New Beetle offered a combined fuel economy of 44 mpg. This was a shocking level of efficiency for the year and helped boost the vehicle’s sales. For the 1999 model year, Volkswagen offered three additional trim levels to the Beetle and increased the overall customization of the vehicle. Each trim level offered the Beetle in front-wheel drive and with a manual transmission. Drivers looking for a used Volkswagen Beetle for sale from this year can find the vehicle available in eight bright colors. The 2000 Volkswagen New Beetle featured no major changes from the previous year, and many of the performance and efficiency specs remained the same. The 2001 Volkswagen New Beetle offered a number of new features including a Monsoon Sound system, theft deterrent system, and updated safety technology. The 2001 model also featured an upgraded exterior, which stayed true to its classic retro styling but with smoother lines. Not much was upgraded on this model in terms of engine options, however an additional trim level was added as well as a few more exterior color options. Drivers looking for this used Volkswagen Beetle for sale can find it in up to 11 colors and 6 different trim levels. 2001 also marked the announcement of one of the Beetle’s special editions, the Beetle RSi, which wouldn’t be available until 2003. For the 2002 model year, the Beetle offered 7 trim levels with its highest trim level equipped with a 6-speed manual transmission, as opposed to the vehicle’s usual 5-speed manual transmission. In 2003, the Beetle was available in a convertible or hatchback and drivers could choose from up to 9 trim levels. However, for the most part, the under the hood configuration stayed the same. 2004 was a major year for updates and changes to the Volkswagen Beetle, however the vehicle maintained its iconic retro styling. Like other model years, the Beetle was available in both a gasoline and diesel engines. However, with this model drivers would be able to opt for the a 6-speed automatic transmission. Drivers looking for this used Volkswagen Beetle will be able to find it in 7 different trim levels and up to 11 exterior colors, as well as in both coupe and convertible body styles. Drivers note that this model of the Beetle features smooth handling and a comfortable cabin compared to previous years. 2005 featured no major changes for the Beetle, however 2006 marked the release of the vehicle’s 2.5L 4-cylinder engine. The Beetle’s 1.9L 4-cylinder diesel engine was still available for this model year and remained a popular option due to its high level of efficiency. Today, drivers can find this used Volkswagen Beetle in two different trim levels, the 2.5 and TDI, and in up to 9 exterior color options. In 2007, the Volkswagen Beetle was no longer available with its efficient diesel engine. In fact, across this model’s three trim levels, the Beetle was only available in the more powerful 2.5L 4-cylinder engine. However, drivers could choose from a 5-speed manual transmission or a 6-speed automatic transmission. The 2007 model year also offered new exterior color options and added an additional trim level. Not many changes occurred for the 2008 model year, however its trim levels were renamed from the previous model and a tire pressure monitoring system and daytime running lamps were included as standard features. For 2009, the Volkswagen Beetle began offering some incredibly advanced entertainment and convenience features including a 10-speaker sound system and satellite radio. Drivers looking for a used Volkswagen Beetle in the 2009 model year can also find it available with leather seating and heated front seats. The last model of this vehicle would be the 2010 Volkswagen New Beetle, however it featured very few changes from its 2009 model. At this point the Beetle had established itself as an iconic vehicle, and its retro styling was sought after by Volkswagen enthusiasts across the country. However, Volkswagen recognized the need for the vehicle’s update and would eventually replace the New Beetle with the Beetle (A5) which appealed to a wider audience. Overall, the Volkswagen New Beetle is a vehicle unlike any other, in both its design and features. Drivers looking to enjoy this retro vehicle can find it among their local used car dealerships in a variety of model years, trim levels, and features. McCluskey Auto is the best option for used vehicles in the Cincinnati, Ohio area. Whether you’re looking for an iconic vehicle like a used Volkswagen Beetle or popular used SUV or truck, you’ll find it among our extensive inventory. Each and every vehicle for sale on our lot has been carefully inspected for quality and has been maintained to the highest of standards. We have hundreds and hundreds of used vehicles for sale on our lot, and our team is passionate about every single one of them. We will happily listen to your needs and budget, and help you find the perfect fit on our lot. Worried about financing with poor credit? With McCluskey Auto, there’s no need to worry. We specialize in offering a variety of financing for drivers with all types of credit. If you’ve been turned away from other dealerships in the area due to poor credit, head right over to McCluskey Auto! We believe every driver deserves to be in a safe and reliable vehicle, and we’re dedicated to making it happen. The team at McCluskey Auto is also happy to offer free lifetime mechanical protection, which offers coverage no matter how many miles you put on your vehicle. At McCluskey Auto, we are proud to offer the best service in the area and the widest selection of used vehicles around. So, if you’re ready to browse a high-quality used car inventory to find the vehicle of your dreams, visit McCluskey Auto today!